Thanks for being patient as I've put this pattern together. 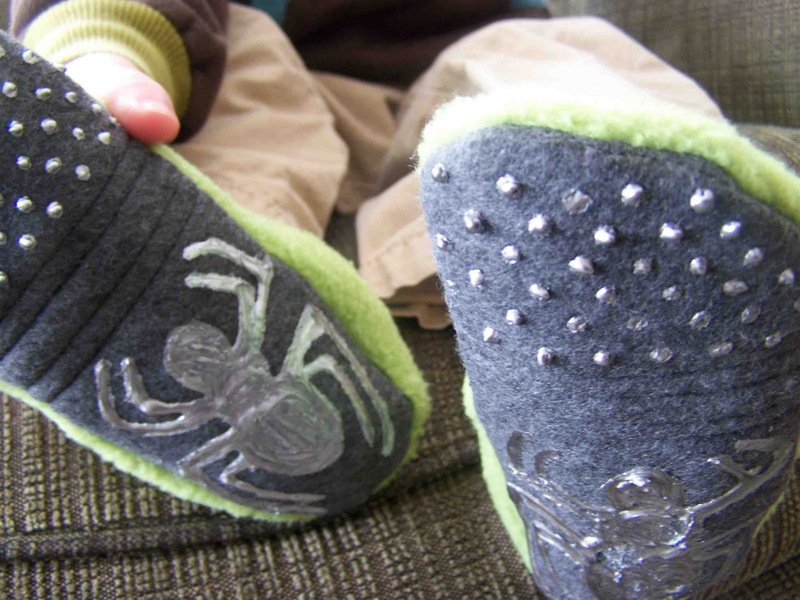 The pattern, I'm sure, is less than perfect, but hopefully it will be helpful as you make some warm slippers for your favorite little feet. First things first. You will want to go and print off the pattern pieces. You can download the pattern here, this is an updated file so hopefully you won't have any problems with it. You will want to make sure that you print the pattern pieces without scaling the images. There is a one inch test square on each pattern paper, check it to ensure that it is scaled properly. 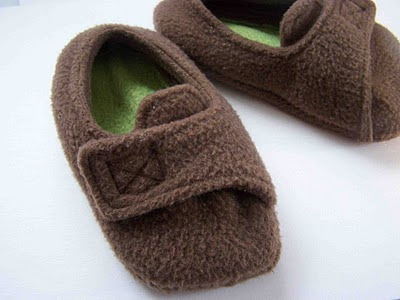 (Slipper size 10/11 here, slippers size 5/6 here-See original pattern for pattern marking key). On the pattern you will notice a dashed line that runs along the slipper upper "tongue". I decided to try out the slippers without the tongue/tab, because I thought that it might make the slippers a bit more gender neutral. If you decide to make the slippers with the tongue, follow the basic instructions below, following the shape of the shoe as you stitch. 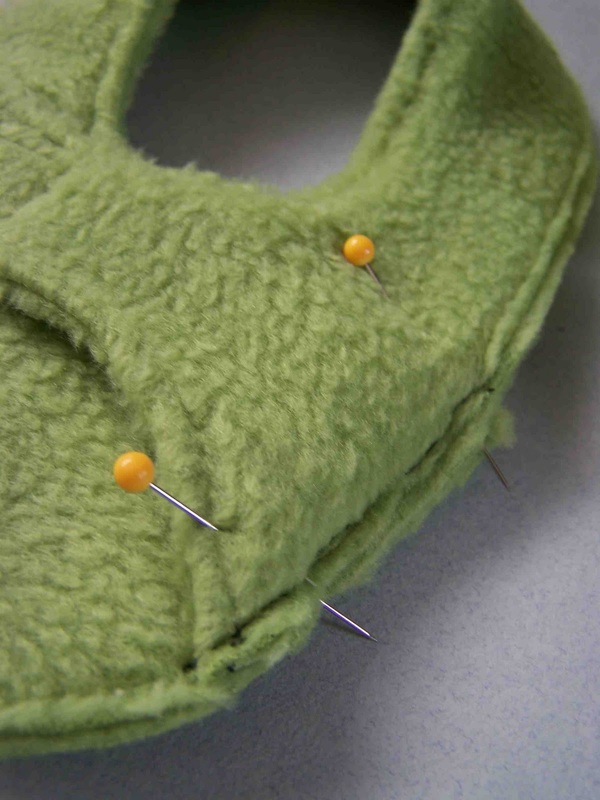 If you choose to sew the slippers without the tab, simply clip off the extra tab when cutting out your pattern pieces. Find the full tutorial below. 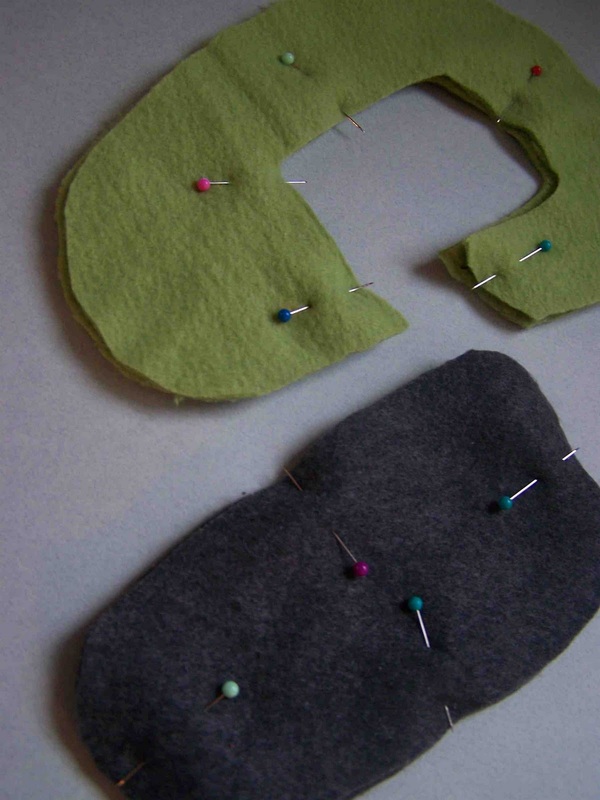 Once you have collected your pattern pieces you will want to cut out one exterior and one lining piece per slipper. The easiest way to do this is to cut out your pattern pieces with your fabric folded in half right sides together. 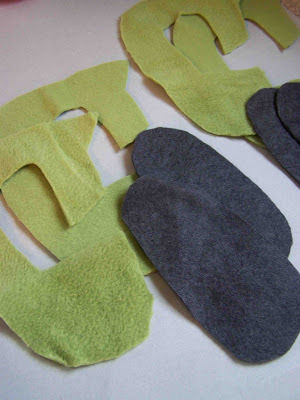 Pin your upper slipper pattern pieces to the fleece, and cut out two at a time. This will give you two pieces, one facing each direction. 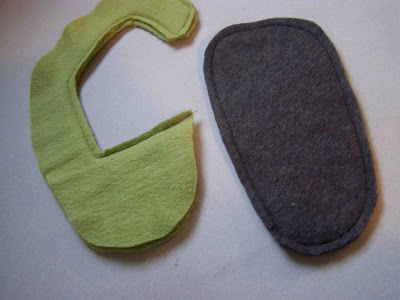 If you are lining your slipper with a different colored fleece then you will want to repeat this process on your remaining fleece color for the lining. 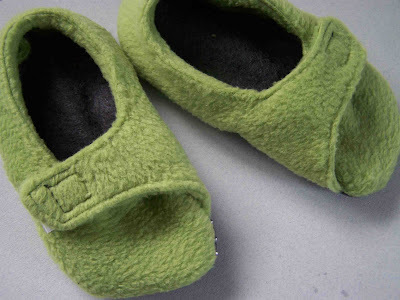 If you are using the same fleece for your exterior and lining pieces, make another set of slipper uppers. Cut out two sets of fleece soles following the same process. You will end up with four upper pattern pieces, and four slipper sole pieces. Pin both sets of slipper upper linings to slipper upper exterior pieces, with right sides together. Pin together both sets of slipper soles with wrong sides together. Using 1/4 inch seam allowances, sew around slipper soles, and along the inner edges (between triangles) of the slipper upper. Trim edges. Clip sharp corners (carefully) to stitching line. Turn slipper uppers right sides out. Pin along raw edges. Edge stitch/stay stitch around the entire perimeter of slipper upper, securing open edges. Stitch 1/8" away from all edges. 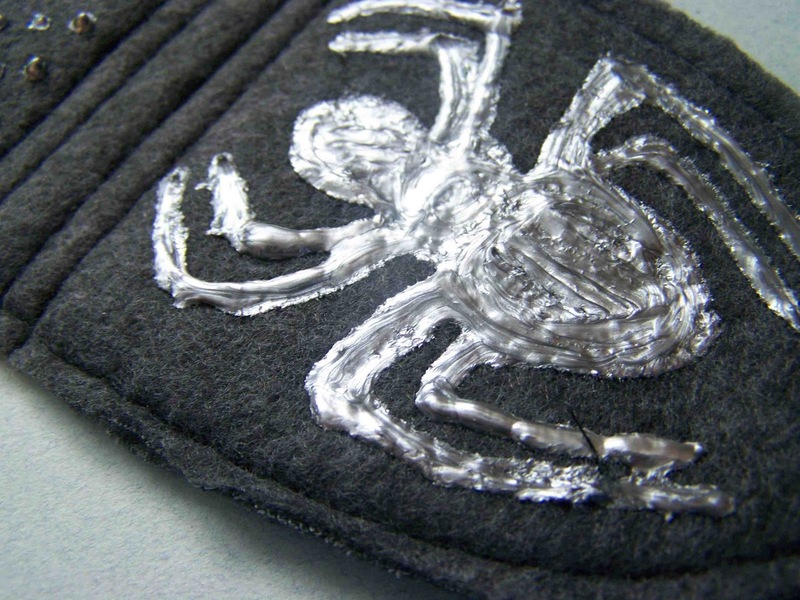 Attach sew on velcro at designated markings. I recommend using a reinforcement stitch to attach velcro closures. 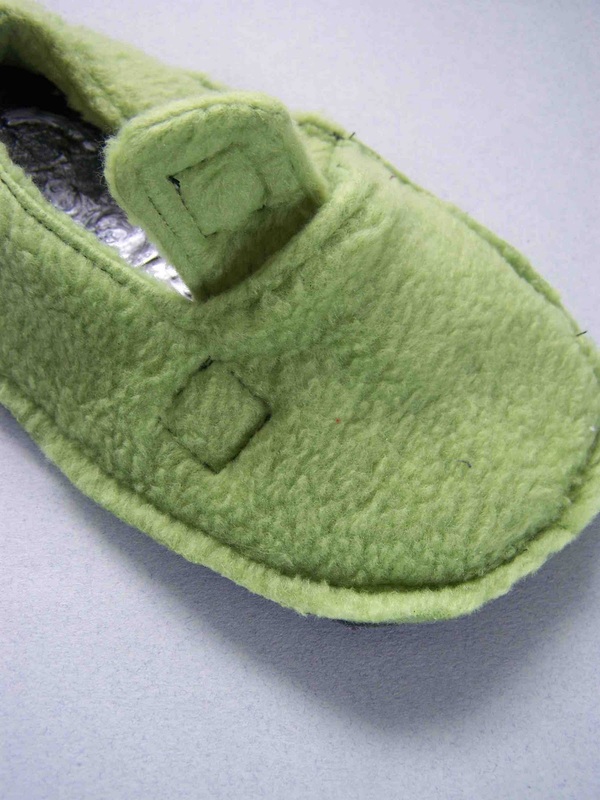 Make sure that you attach the velcro to the bottom side of the strap, and the top side of the slipper upper main. Match up dots on slipper upper. Pin in place. Machine baste together. To add some grip to your slippers, you can use three dimensional fabric paint to provide a bit of traction to the bottom of the soles. I ended up making a Spiderman logo and some dots. This can be done now, or after finishing the slippers. Take into account that the puff paint will need several hours to dry. The bottle said four, but my thick spider needed more like fourteen. 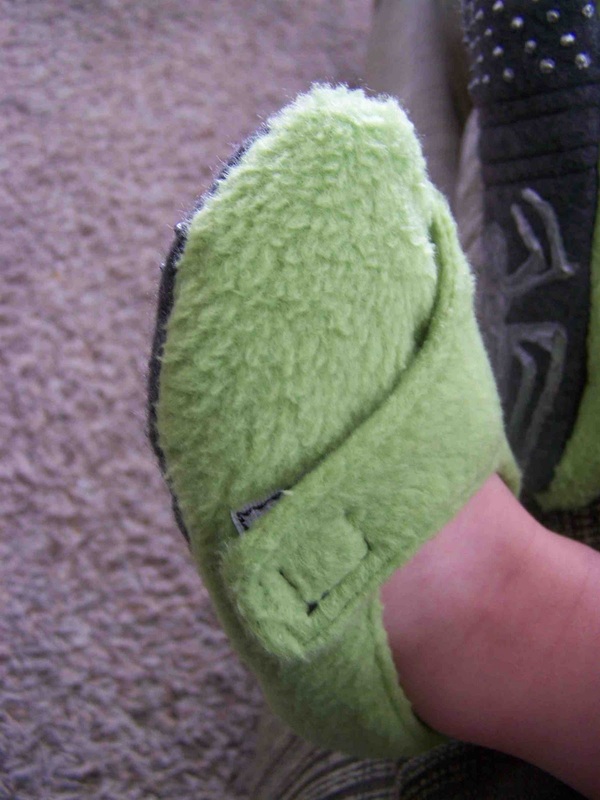 To attach the slipper upper to the sole you will want to turn the slipper upper inside out. 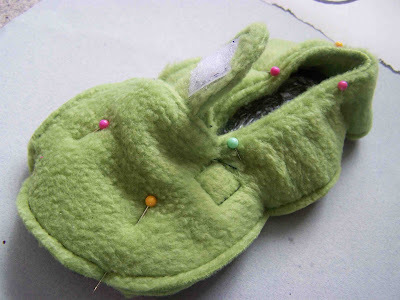 With the bottom of the sole facing upward (see grippers), pin the slipper upper in place. Match up center backs. Pin around the entire slipper. Pull the strap out of the way to avoid stitching it into the seam allowance. Using 1/4" seam allowances (or 3/8" for slightly smaller slipper) stitch around the slipper. Trim seam. Turn slippers right sides out. Enjoy some nice warm toes. Clark loves his new Spidey slippers. Do you? They even stay on his feet while he is running around. 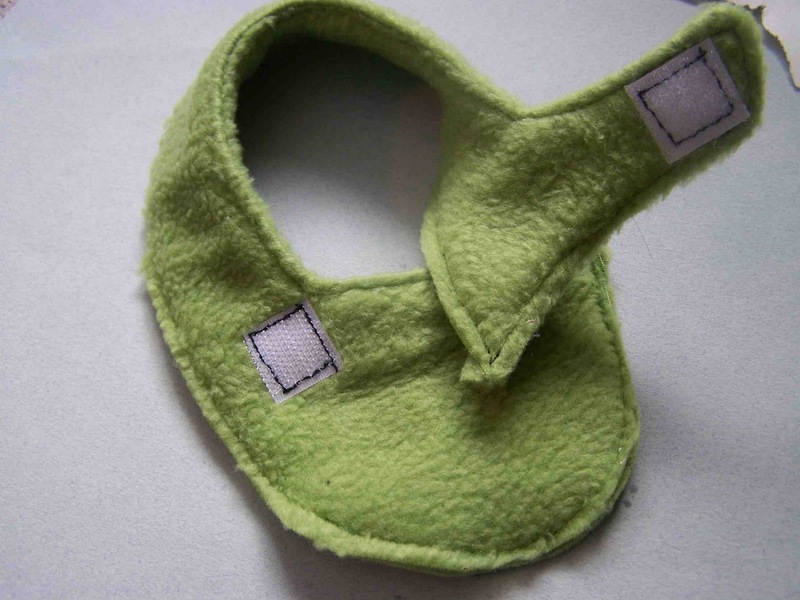 If your child has a narrower heel, you could consider attaching a bit of elastic to the back of the heel. 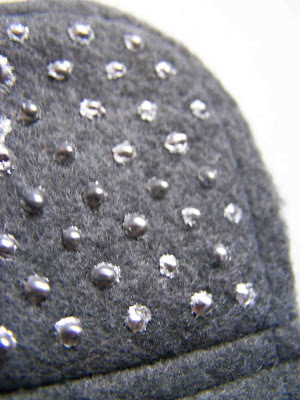 To dress it up you can consider hand sewing a button on top of the velcro closure. You could also make some cute fleece flowers, or add some beading, trim, or sequins to your little girl's pair. So cute!!!! And I have been wondering how to make the non-slippery soles - thanks for that! This is great! Thank you for this tutorial! I'm going to try it! Love these! Thanks for putting this together. Those are so cute, thanks for all the time you put into making these tutorials. I just finished copying your ruffle petal tutorial from August and I love how it turned out. Thanks so much:). Super cute! I'm new to your blog (and new to blogging, too!). Got here from the Sew Can Do Craftastic Linky Party! That's great! If you have not been by yet, make sure you enter my linky contest! The best of January 2011 will be showered with prizes! I also have some great Valentines giveaways going on right now! so cute! Thanks for the pattern! Thanks for sharing your talent. I can't wait to try this out. My 3 year old loves, loves, loves slippers! I'll have to make her a pair. Thanks for sharing. THANK YOU,,, this is amazing, and spidey is the icing on the cake. You are awesome Tricia, seriously. I can so picture little man Clark running around in those, so cute!!! I'm so excited to make these for my little girl! She's always borrowing my slippers so it will be nice for her to have some of her own :) Thanks! Well, that is pretty cool slippers. Great pattern! Oh my goodness - these are absolutely adorable. Thank you so very much for this free pattern. My son happens to have size 7/8, and I am very excited to whip this up! Now let's hope they're still large enough to fit come October. these look great. i tried to download (from the uk) i am asked to donate another document to scribd, or pay $9 per print/download. i don't have anything to share with scribd right now so this isn't a free pattern for me. or did i get something wrong? Just finished making these and this tutorial had the best instructions. Super well written and easy to follow. Thank you! Unfortunately, my lil guy "lost" my Velcro, so I added buttons and a buttonhole instead. They're adorable! I've been looking for a slipper pattern for some shoes for Peanut, but he is only 6 months! I'm going to resize the pattern to fit him, would you be okay if I posted the resized pattern to my blog with general instructions on how to resize it? I will link back to here as the original. I always want to do thing like this but I don't know how. You make it very easy to follow so I'll try to do it too! I just made these for my twins and they were sooooo easy to make. Thank you for the pattern and tutorial! That's so great ideas to save my money, thank you your ideas that I can make for people in my family. I didn't read all the way through the comments, so I'm not sure if this is a repeat, but do you have any suggestions for making the slippers a size bigger? My boys wear a 9. They look super cute and pretty simple. Thanks for sharing! I mirror Beth. These fit my son very well, but I need them a little bigger for my daughter? Do you think it would work to zoom in on the pattern on a copier? This was a great tutorial! Mine turned out really well! Thanks! Hey folks -- I did re-size the slipper pattern and it worked fairly well. I think I did end up reshaping, but not by much. Hi!! I wanted to thank you for this pattern! I love it!! I've made slippers for both of my kids, my nieces and have given away a couple pairs I made. I was curious if you minded if I made some to sell with fleece pants/longies I make or if you prefer this only for personal use :) I have no intention of selling the pattern or taking credit for it as you did an amazing job! I was just wondering :) if you would rather it stay personal use then I will respect that. Thanks again! My kids love them! So, I made these but they are falling off my LOs feet in the back. How do I add the elastic now so they stay put? Thank you so much! Thanks so much for this pattern, I just made the smallest size for my large 10mo boy. I used plastic snap fasteners in lieu of velcro and they're working out well so far. I seen these lines in the soles of tour sons shoes but it never mentions them in the tut? Did you use a quilter loft in them? Or some kind of cushioning? I just made your pattern. it was so cute and really easy. Thanks for posting this info.